Clothing/Jewelry Description A charcoal-gray jacket with a blue front, dark blue denim leggings, a gray sweater and brown shoes. Medical Conditions Andersen has several medical conditions requiring regular medication, which she doesn't have with her. She has previously suffered episodes of depression and she was emotionally distressed at the time of her disappearance. Distinguishing Characteristics Caucasian female. Blonde hair, blue eyes. Andersen has the following tattoos: a shamrock on her buttocks, a salamander on her toe and a flower on her ankle. She has a scar near her left eyebrow, a scar on her right wrist and a scar on the outside of her left ankle. Her ears are pierced. 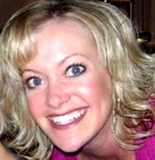 Andersen was last seen at at her apartment near 120th Street and Blondo Street in Omaha, Nebraska at approximately 1:00 a.m. on March 9, 2010. She was depressed at the time of her disappearance and her parents had gone to stay with her to help. She left a note for them, saying she was going for a drive. Andersen has never been heard from again. On March 15, her maroon 2001 Chevrolet Lumina with the license plate number RJK303 was found locked and abandoned near Rick's Boatyard Cafe at in the 300 block of Riverfront Drive, east of the Qwest Center. Her wallet and purse were inside it, but her keys were missing. Since her disappearance, Andersen hasn't accessed her credit cards or bank accounts, and she left her cellular phone behind. The restaurant where her car was found is near the Missouri River and authorities searched the river, but found no clues there. Andersen worked as a registered nurse at Methodist Hospital in Omaha at the time of her disappearance. She grew up in Sutton, Nebraska, a small town two hours from Omaha, and graduated from Sutton High School and Doane College. Although authorities don't suspect foul play was involved in her case, it's uncharacteristic of her to leave without warning and her family believes she is in danger. Her case remains unsolved. Updated 2 times since October 12, 2004. Last updated August 1, 2016; picture added.